Conversion rate optimisation (CRO) is the discipline of persuading people to take action on your website. The macro objective is usually to generate more sales and leads from your existing web traffic. Every company interested in CRO wants the same thing: make the most amount of money in the shortest possible time. What’s the best way to go about that? 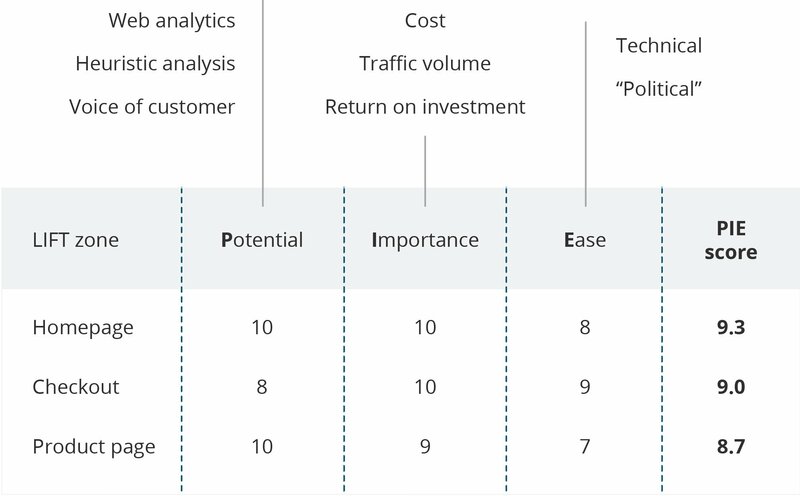 In this article I suggest a framework for prioritising CRO activities. The optimisation opportunities are numerous, since each page comes in various shapes and sizes: desktop vs mobile, Chrome vs Firefox, iOS vs Android, etc. There are innumerable device/browser combinations that result in different user experiences. Let’s say you’ve done all your user research and now you’ve got a massive list of stuff to try out on the website. It’s a laundry list of potential conversion bottlenecks e.g. stating delivery costs upfront, payment methods are confusing, absent value proposition on the product page, formatting errors on step 3 of the checkout on Android phones, whatever! Fix. I need to fix this because it’s blatantly obvious it’s causing issues for our website visitors. Test. I have a hypothesis and I need to run an A/B test to see if I’m right or wrong. Secondly, cluster all your ideas into groups with commonalities. Many of your data insights will naturally cluster into the same hypothesis. That means they can be validated as part of the same fix or A/B test. For example, say you think that your product page has various navigation and fold issues on mobile devices. You would run a single A/B test to address all these issues together. You want to cluster similar ideas even if they originated from multiple data sources (user testing, analytics, surveys, etc.). Obviously, fix the broken stuff first. Then move onto the test ideas. CRO prioritisation is a balance between business impact (money) and time to market. 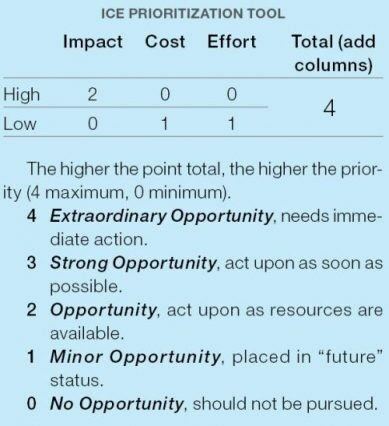 Whether it’s a fix or a test, you should develop a prioritisation system that measures impact vs time i.e. the opportunity. Both PIE and ICE have limitations because they are based on scoring systems that are subjective. How do you score ‘potential’ out of 10? How do you score ‘effort’? PIE and ICE are better than nothing, but both are self-defeating because the purpose of a prioritisation system is to remove subjectivity from the process. Determining the duration of an A/B test requires an understanding of statistics (sample size, minimum detectable effect, confidence, etc). Likewise, determining ‘time to fix’ requires an understanding of development resource, technical complexity and office politics. Revenue impact is derived from your Google Analytics data. The formula is based on traffic, average order size and existing conversion rates. Don’t prioritise CRO around ‘made up stuff’, try some facts and make money faster. Using a prioritisation model that focuses on return vs time-to-market turns a subjectives process into an objective one. Use page-level data to prioritise the ‘money changes’ that should be made first. 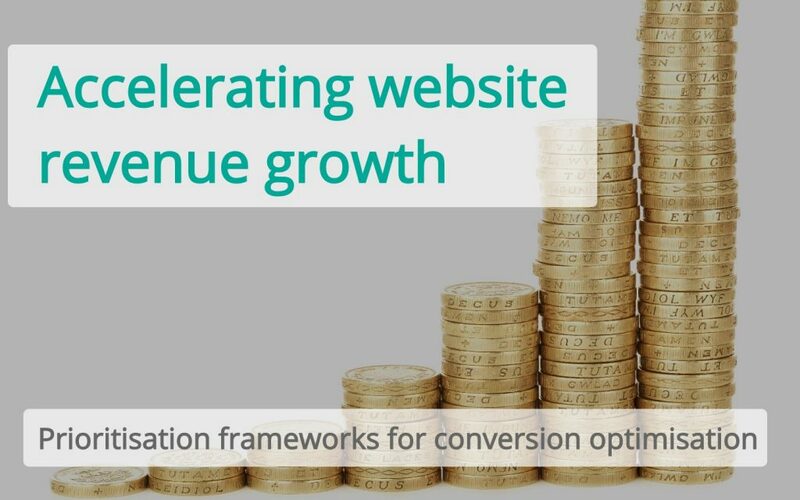 Interested in leveraging prioritisation frameworks to maximise website revenue? Want to learn more about how CRO can drive growth for your online business? Get in touch and I’ll share tips and tricks to get you moving.